This post was developed and written by Jeremy Cowan, Thomas Fuller, Samuel Karp, and Akram Chetibi. Containers have revolutionized the way that developers build, package, deploy, and run applications. Initially, containers only supported code and tooling for Linux applications. With the release of Docker Engine for Windows Server 2016, Windows developers have started to realize the gains that their Linux counterparts have experienced for the last several years. This week, we’re adding support for running production workloads in Windows containers using Amazon Elastic Container Service (Amazon ECS). Now, Amazon ECS provides an ECS-Optimized Windows Server Amazon Machine Image (AMI). This AMI is based on the EC2 Windows Server 2016 AMI, and includes Docker 17.06 Enterprise Edition and the ECS Agent 1.16. This AMI provides improved instance and container launch time performance. It’s based on Windows Server 2016 Datacenter and includes Docker 17.06.2-ee-5, along with a new version of the ECS agent that now runs as a native Windows service. In this post, I discuss the benefits of this new support, and walk you through getting started running Windows containers with Amazon ECS. When AWS released the Windows Server 2016 Base with Containers AMI, the ECS agent ran as a process that made it difficult to monitor and manage. As a service, the agent can be health-checked, managed, and restarted no differently than other Windows services. The AMI also includes pre-cached images for Windows Server Core 2016 and Windows Server Nano Server 2016. By caching the images in the AMI, launching new Windows containers is significantly faster. When Docker images include a layer that’s already cached on the instance, Docker re-uses that layer instead of pulling it from the Docker registry. The ECS agent and an accompanying ECS PowerShell module used to install, configure, and run the agent come pre-installed on the AMI. This guarantees there is a specific platform version available on the container instance at launch. Because the software is included, you don’t have to download it from the internet. This saves startup time. The Windows-compatible ECS-optimized AMI also reports CPU and memory utilization and reservation metrics to Amazon CloudWatch. 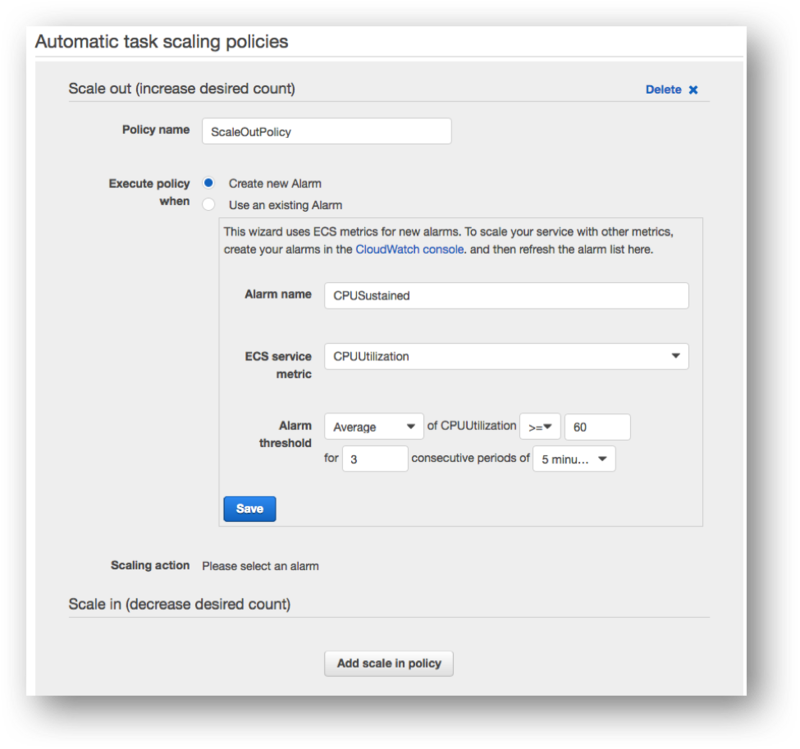 Using the CloudWatch integration with ECS, you can create alarms that trigger dynamic scaling events to automatically add or remove capacity to your EC2 instances and ECS tasks. To help you get started running Windows containers on ECS, I’ve forked the ECS reference architecture, to build an ECS cluster comprised of Windows instances instead of Linux instances. You can pull the latest version of the reference architecture for Windows. If you don’t specify a cluster name when you initialize the agent, the instance is joined to the default cluster. Adding -EnableIAMTaskRole when initializing the agent adds support for IAM roles for tasks. Previously, enabling this setting meant running a complex script and setting an environment variable before you could assign roles to your ECS tasks. When you enable IAM roles for tasks on Windows, it consumes port 80 on the host. If you have tasks that listen on port 80 on the host, I recommend configuring a service for them that uses load balancing. You can use port 80 on the load balancer, and the traffic can be routed to another host port on your container instances. For more information, see Service Load Balancing. Now that you have a cluster running, step through how to build and push an image into a container repository. You use a repository hosted in Amazon Elastic Container Registry (Amazon ECR) for this, but you could also use Docker Hub. To build and push an image to a repository, install Docker on your Windows* workstation. You also create a repository and assign the necessary permissions to the account that pushes your image to Amazon ECR. For detailed instructions, see Pushing an Image. * If you are building an image that is based on Windows layers, then you must use a Windows environment to build and push your image to the registry. Now that your image is built and ready, the next step is to run your Windows containers using a task. Start by creating a new task definition based on the windows-simple-iis image from Docker Hub. Choose Task Definitions, Create new task definition. Copy and paste the following JSON into that field. You can now go back into the Task Definition page and see windows-simple-iis as an available task definition. There are a few important aspects of the task definition file to note when working with Windows containers. First, the hostPort is configured as 8080, which is necessary because the ECS agent currently uses port 80 to enable IAM roles for tasks required for least-privilege security configurations. There are also some fairly standard task parameters that are intentionally not included. For example, network mode is not available with Windows at the time of this release, so keep that setting blank to allow Docker to configure WinNAT, the only option available today. Also, some parameters work differently with Windows than they do with Linux. The CPU limits that you define in the task definition are absolute, whereas on Linux they are weights. For information about other task parameters that are supported or possibly different with Windows, see the documentation. A task is typically a short-lived process that ECS creates. It can’t be configured to actively monitor or scale. A service is meant for longer-running containers and can be configured to use a load balancer, minimum/maximum capacity settings, and a number of other knobs and switches to help ensure that your code keeps running. In both cases, you are able to pick a placement strategy and a specific IAM role for your container. Select the task definition that you created above and choose Action, Run Task. Leave the settings on the next page to the default values. Select the ECS cluster created when you ran the CloudFormation template. Choose Run Task to start the process of scheduling a Docker container on your ECS cluster. You may have noticed that the example task definition is named windows-simple-iis:2. This is because I created a second version of the task definition, which is one of the powerful capabilities of using ECS. You can make the task definitions part of your source code and then version them. You can also roll out new versions and practice blue/green deployment, switching to reduce downtime and improve the velocity of your deployments! This is a nice start to deploying a simple single instance task, but what if you had a Web API to be scaled out and in based on usage? This is where you could look at defining a service and collecting CloudWatch data to add and remove both instances of the task. You could also use CloudWatch alarms to add more ECS container instances and keep up with the demand. The former is built into the configuration of your service. Select the task definition and choose Create Service. The following screenshot shows an example where you would add an additional task instance when the CPU Utilization CloudWatch metric is over 60% on average over three consecutive measurements. This may not be aggressive enough for your requirements; it’s meant to show you the option to scale tasks the same way you scale ECS instances with an Auto Scaling group. The difference is that these tasks start much faster because all of the base layers are already on the ECS host. Do not confuse task dynamic scaling with ECS instance dynamic scaling. To add additional hosts, see Tutorial: Scaling Container Instances with CloudWatch Alarms. This is just scratching the surface of the flexibility that you get from using containers and Amazon ECS. For more information, see the Amazon ECS Developer Guide and ECS Resources.